On Tuesday, February 12, the Cypriot Police arrested a 36-year-old in connection with the disputed medical card issued to Nigeria international Francis Uzoho prior to his maiden appearance for Anorthosis Famagusta. Sigma Live revealed that the individual arrested is a woman and new developments cannot be ruled out before the end of the day. The Cypriot Police confirmed the arrest on Tuesday afternoon in a tweet and stated that the individual was arrested for conspiracy offenses and interference in court proceedings. Meanwhile, the Police have decided to release Anorthosis deputy chairman Kyriacos Yiangou, who was earlier arrested on the suspicion of falsifying Uzoho's medical card. 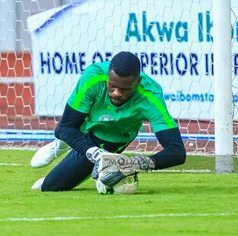 The Cyprus Sports Organisation (KOA) cancelled Uzoho's medical card after the goalkeeper reportedly told Police that he was on his way to Cyprus when the document was issued. The Super Eagles goalkeeper, who was interviewed by Police last Thursday, was omitted from the Anorthosis Famagusta squad against Nea Salamis on February 9.